Is U.S. foreign policy based on myths? Public pressure has helped push back against a bill in Congress that would have torn up the negotiated agreement with Iran by imposing yet more sanctions on the people of that country. The people of this country are not eager for another war, and have not accepted that sanctions lead away from war rather than into it. But supporters and opponents of that bill tend to agree that Iran has a nuclear weapons program, and that this program must be stopped by one means or another. This underlying assumption is not supported by any evidence and never has been. We’ve heard it propounded for over thirty years, and the repetition has had its intended effect, but any evidence at all has always been lacking. A belief without evidence is a myth. Iran has a nuclear energy program because the U.S. and European governments wanted Iran to have a nuclear energy program. The U.S. nuclear industry took out full-page ads in U.S. publications bragging about Iran’s support for such an enlightened and progressive energy source. The U.S. was pushing for major expansion of Iran’s nuclear program just before the Iranian revolution of 1979. Since the Iranian revolution, the U.S. government has opposed Iran’s nuclear energy program and misled the public about the existence of a nuclear weapons program in Iran. This story is well-told in Gareth Porter’s new book, Manufactured Crisis, and by Porter is his upcoming interview this week on Talk Nation Radio. The U.S. assisted Saddam Hussein’s Iraq in a war against Iran in the 1980s, in which Iraq attacked Iran with chemical weapons. Iran’s religious leaders had declared that chemical, biological, and nuclear weapons must not be used, even in retaliation. And they were not. Iran could have responded to Iraqi chemical attacks with chemical attacks of its own and chose not to. Iran is committed to not using or possessing weapons of mass destruction. The results of inspections bear that out. Iran’s willingness to put restrictions on its legal nuclear energy program — a willingness present both before and after sanctions — bears that out. Inspections should continue. All steps should be taken to move the world toward safe and sustainable energy sources. But can we drop the idea that Iran wants to nuke us? It’s odd how quick we are to spot government deception or ill will when it comes to new health insurance programs, taxes, environmental regulations, or any domestic policy, and how trusting and naive we are when it comes to war. One would think we’d have learned our lessons. Eisenhower warned us that preparing for war would bring war. When the Soviet enemy disappeared, new ones were quickly found. According to both former NATO commander Wesley Clark and former UK prime minister Tony Blair, the Pentagon has a list of several nations’ governments to be overthrown. The vast stockpiles of weapons in Iraq weren’t there. The claims about chemical weapons attacks in Syria have fallen apart. The evidence that the Libyan government was planning to slaughter civilians has not held up — although plenty of civilians died under NATO’s bombing and are dying now in the chaos left behind. Increased U.S. militarism in Asia is being followed by increased military spending by Asia (although we tend to reverse the chronology and the cause-and-effect in our minds). We are supposed to learn from experience. It should matter to us that there was never any evidence that Mexico attacked the United States, that Spain blew up the Maine, that the Vietnamese fired in the Gulf of Tonkin, or that Iraq had a nuclear weapons program. When you hear advocates for war and peace alike refer to “the Iranian nuclear weapons program,” ask them for some evidence. War gains support and acceptance from widespread belief in false information, and the accumulation of false information into generally false concepts or myths about war. This is good news, because it means we are not intractably divided by ideology or worldview. Rather, we will find more widespread agreement about war if we can just achieve more widespread awareness of accurate information. 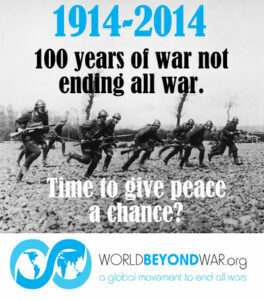 WorldBeyondWar.org has also created a Prezi (kind of a cooler PowerPoint) to allow people to present to real-world groups the information that has been collected on the WorldBeyondWar website. Here’s the same presentation as a PDF.